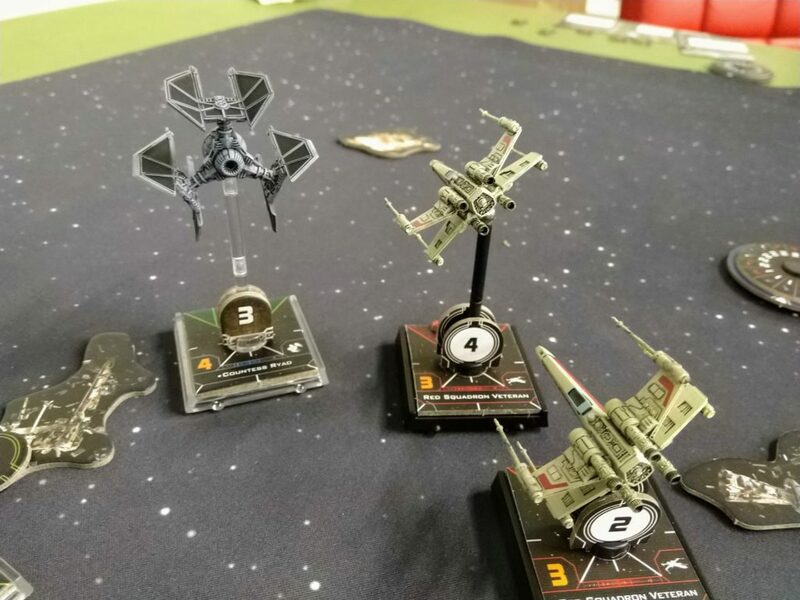 Recently I got hassled at the local shop for breaking out my B-Wings for yet another Friday of X-Wing, so I started developing some new lists. In one idea I had a point to spend and open slots on a Green Squadron A-Wing. I realized that you could combo Veteran Instincts, A-Wing Test Pilot, and Adaptability to bump it up 3 pilot skill levels for just 1 squad point cost, taking it to PS6. But would that be actually do anything, let alone be the best option? A credible theory I’ve put some stock into is that there’s almost no value to increasing pilot skill in the middle band from ~3 to ~6, because aces will still beat you and swarm ships were already below you. So, I got to wondering: What is the average skill of all the pilots in the game? 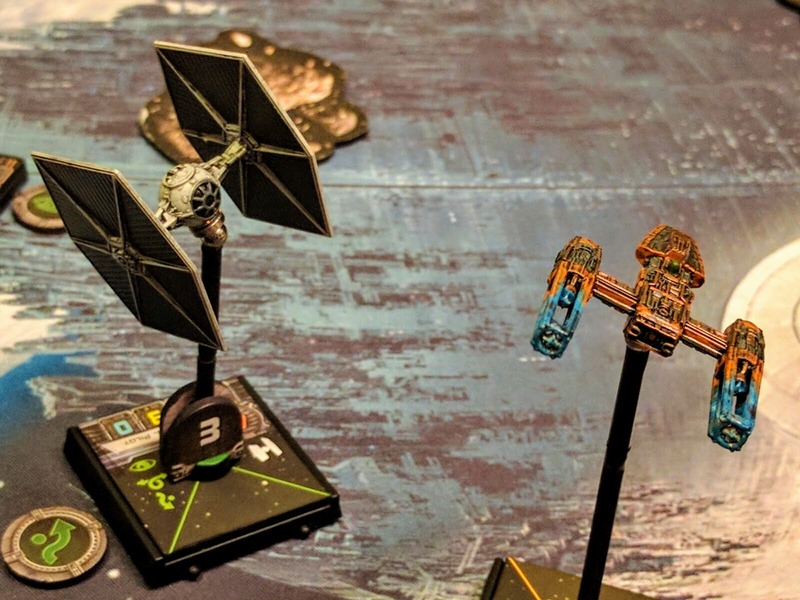 The theory is that if the combo puts the A-Wing’s pilot skill above half the ships in the game then it would get to shoot more than half the ships it might encounter before they could shoot it, and that’s maybe worthwhile. But then I had an important follow-on observation: There are a ton of unpopular pilots and ships in the game. So what is the average skill of all the pilots people actually use? To answer those questions I wrote some simple programs to compile the necessary data from a couple sources. That data is then exported as simple CSV files, so that even non-programmers can play around with them using any spreadsheet tool they wish and conduct their own data-driven investigations toward squadron building. The scripts as well as archived outputs are linked below, along with an example of how to use the data in answering those pilot skill questions. From there I also continue development of my metrics for evaluating beginner squadrons. A brave Green Squadron pilot homes in on a B-Wing. 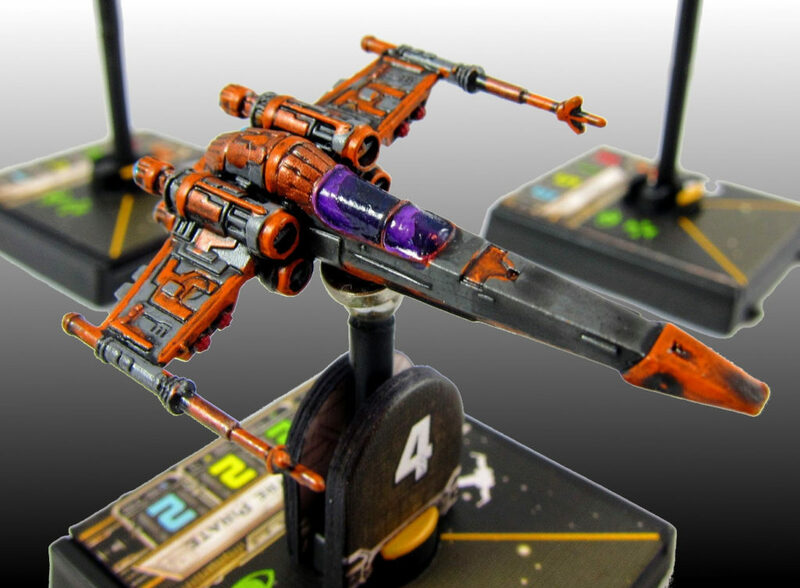 The X-Wing community has built a number of great resources and data sets, many of which interoperate. 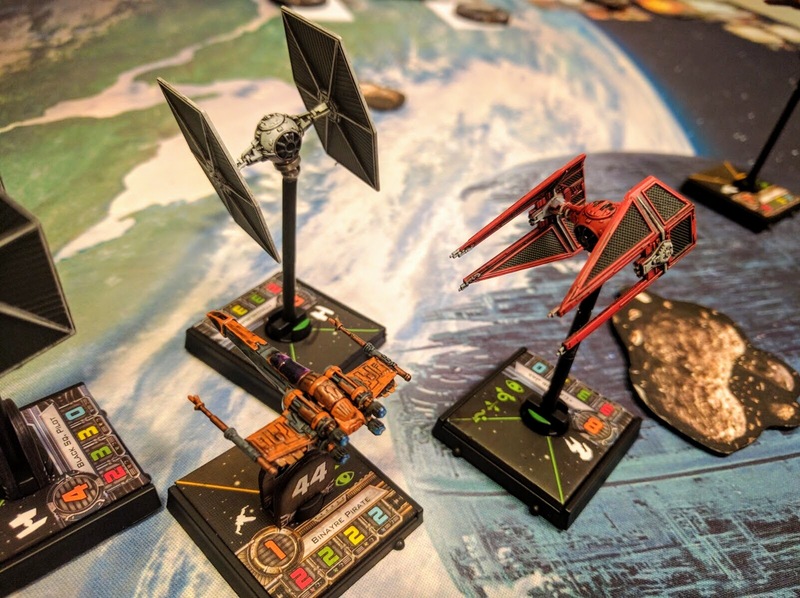 In particular, most of them use identifiers and schemas from the X-Wing Squadron Specification (XWS) so that they can do things like import and export squad lists to and from other tools. 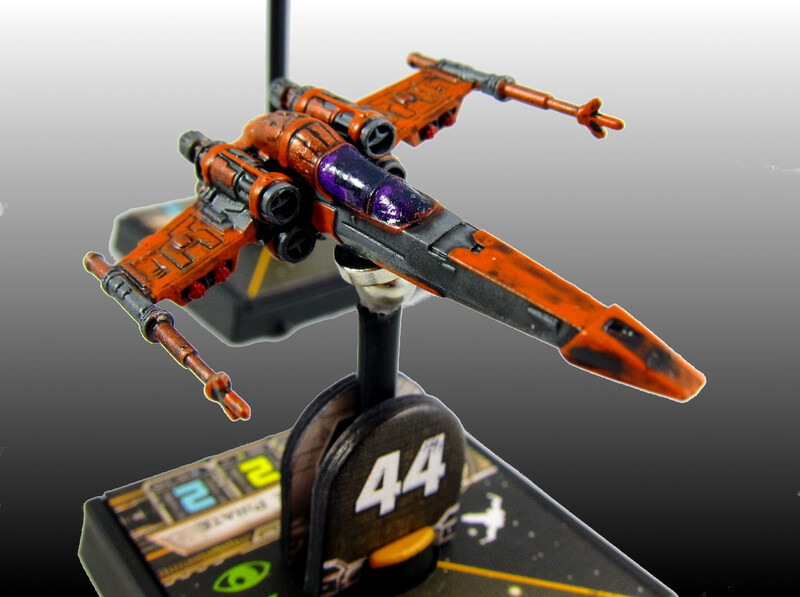 Several tools also directly utilize the comprehensive card data and images collected in the X-Wing Data repository. Many tournament lists have been upload over the past ~3 years to List Juggler by event organizers and community members. The latter itself presents a lot of interesting data for analysis (e.g., its time series charts), but I couldn’t seem to clearly answer some of the questions I had with just its web interface. 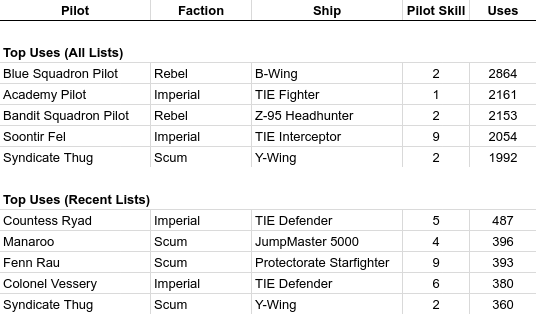 So I wrote a script to download lists from List Juggler, and another to correlate them with the ship and pilot data from X-Wing Data. Those scripts are available in the X-Wing CSV repository on GitHub. So that non-programmers don’t have to set up the programming environment required to run the scripts, archived data is included in the repository. These are linked from the main README page, which will be updated as new releases come out. 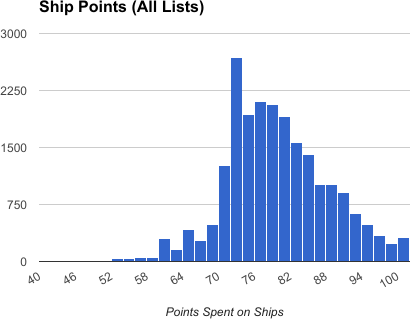 ships.csv: All the nominal ships stats and properties. 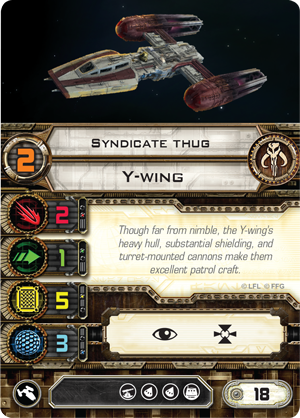 Technically stats are defined by specific pilot cards, but in reality there is only one pilot with different baseline stats for its ship class: The Outer Rim Smuggler, a lesser version of the YT-1300. So most people quite reasonably tend to think in terms of ship classes and associated stats, which are presented here. The Smuggler is included as a separate entry. Auto-include titles like Alliance Overhaul and similar upgrades that effectively change the baseline stats for a class are not incorporated. 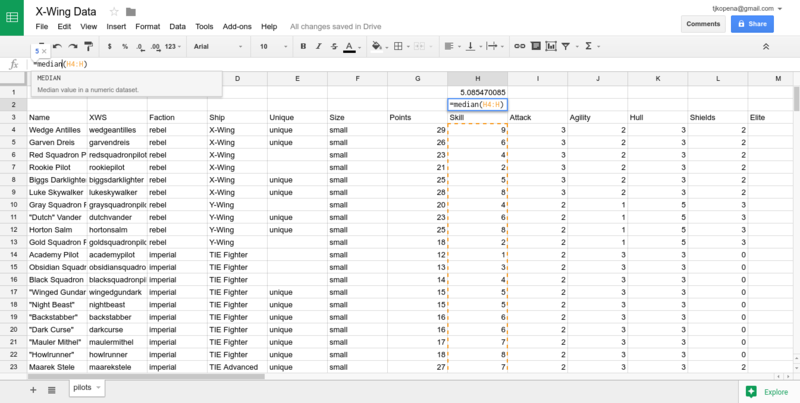 pilots.csv: All of the pilots in the game, their ship stats, and counts breaking down all the times that pilot has been used in a list captured in List Juggler. These are reported for all lists as well as lists for events held within the past 4 months. lists.csv: Summaries of all the lists captured in List Juggler. The core of this are summed stats needed to do some simple squadron analysis based on raw attacks, agility, hull points+shields, and the number of ships. For consistency in its most typical use the compilation only includes standard dogfight tournaments. A small number of events in List Juggler are marked as standard but report lists of over 100 points in ships alone, which are discarded. The script does not currently evaluate upgrade card costs to determine invalidity of other lists. 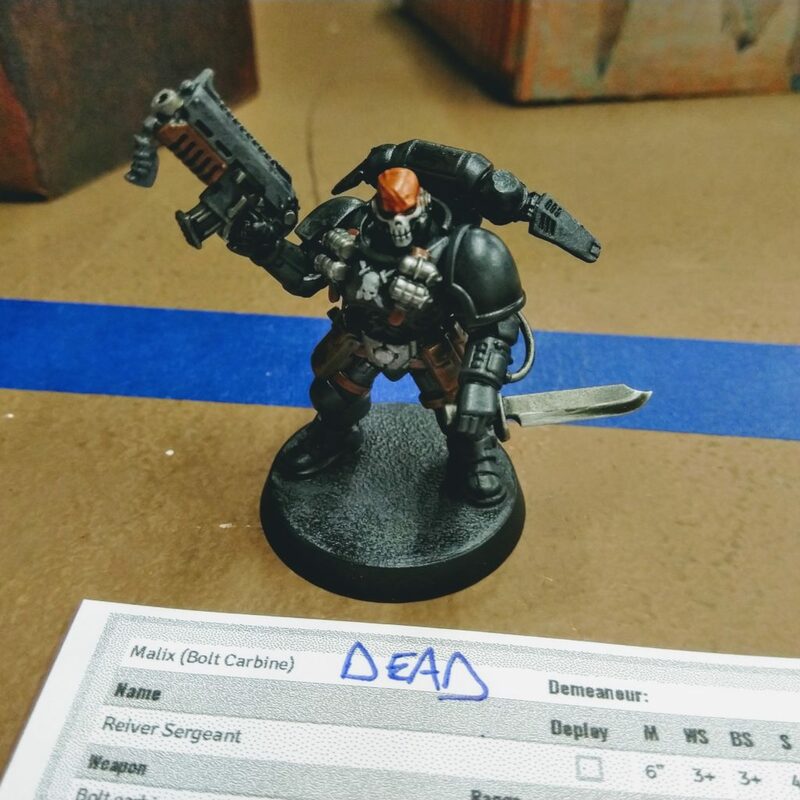 There are also a small number of lists reported that are obviously either incomplete or for a smaller, non-standard event format, such as Escalation or Ace Wing, but not marked appropriately. It is sometimes difficult to tell even manually if these are valid, and would be somewhat difficult to reliably weed out automatically. For now they are therefore simply included—future code additions processing all the upgrades might tackle excluding these. However, they’re such a miniscule portion of the reported lists, a few dozen out of tens of thousands, that they don’t affect the statistics meaningfully. As a quick summary, there are currently 40 ships in the game for standard play (plus the Outer Rim Smuggler), and 5 more for Epic play. With Wave X having just hit stores recently, there are 234 dogfighting pilots. 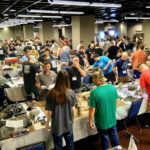 The scripts are able to export 21,419 squadron lists from List Juggler, encompassing 66,677 pilot selections fielded over the course of 1,555 tournaments from summer 2014 to now. That’s quite a bit of usage data for a tabletop game, enabling a variety of basic quantitative analyses. 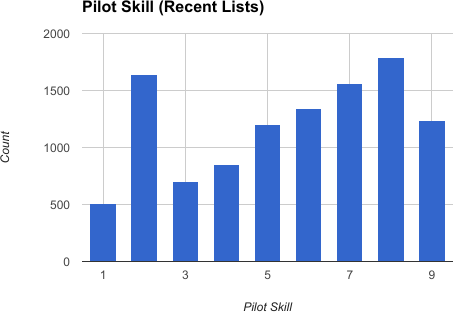 Answering the initial question about average pilot skill is trivial with the pilot data. First import pilots.csv into your spreadsheet program; in this demonstration I use Google Spreadsheets. Insert two rows at the top of the table. At the top of the Skill column (H), enter the formula =average(H4:H). Given that baseline pilot skill is on a fixed scale from 1 to 9 there can’t be outliers skewing the average, but just to check we’ll also compute the median. In the second row of the Skill column enter the formula =median(H4:H). The two values are almost identical, 5.085 for the average and 5 for the median. That the median is 5 means by definition that at least half the pilots in the game have a pilot skill of 5 or lower. We can check this precisely by adding another row and another formula, =countif(H5:H,"<=5"). Finally, to quickly get a count of how many ships there are, add another row and the formula =counta(H6:H). Those reveal that 126 out of 234 distinct pilots in the game, 54%, have pilot skill 5 or less. That means we can make a simple claim about spending a squad point to boost a Green Squadron pilot to PS6: It’ll then shoot before more than 54% of the pilots it could possibly face off against. But what about the pilots it is likely to encounter? Computing average and media pilot skill for all pilots in the game. That can also be answered using pilots.csv, still in Google Docs. First freeze the display so the labels remain in view while scrolling: Select the “Name” label, cell A5. Under the View -> Freeze menu, select “Up to current row” and then “Up to current column.” The column labels and pilot names will now be fixed in the display. All the way over to the right of the data, use the empty column AM to multiply the Total All Time Uses (Y) and Skill (H) columns by entering the formula =Y6*H6 in the first pilot’s row (Wedge Antilles). Select that cell and all those below it down to the bottom of the data and then hit CTRL+D to copy that formula (“fill down”) into all the selected cells. Back at the top, use the empty cell AM4 to sum all of those values with the formula =sum(AM6:AM). Put similar in column Y, All Time Total Uses: =sum(Y6:Y). In another empty cell divide the former by the latter, =AM4/Y4, to get the average of all pilot skills ever used in List Juggler’s tournament reports. The median would take a bit more effort to compute from this data compilation, but as there are no pilot skill outliers the average shouldn’t be overly skewed so it’s not necessary to do so. The result of average pilot skill 5.06 is shockingly close to the average and median for what’s available in the game. I expected the average pilot skill in actual use to be closer to 7 given the longstanding popularity of high pilot skill aces like Soontir Fel. A follow-up question then is that perhaps pilot skill has crept higher with more recent releases? However, that turns out not to be the case. The data compilation also includes Total Recent Uses, which can be similarly used to compute the average pilot skill over lists used in the past four months. That average is a tad higher at 5.5, but still very close to the center of the possible range. 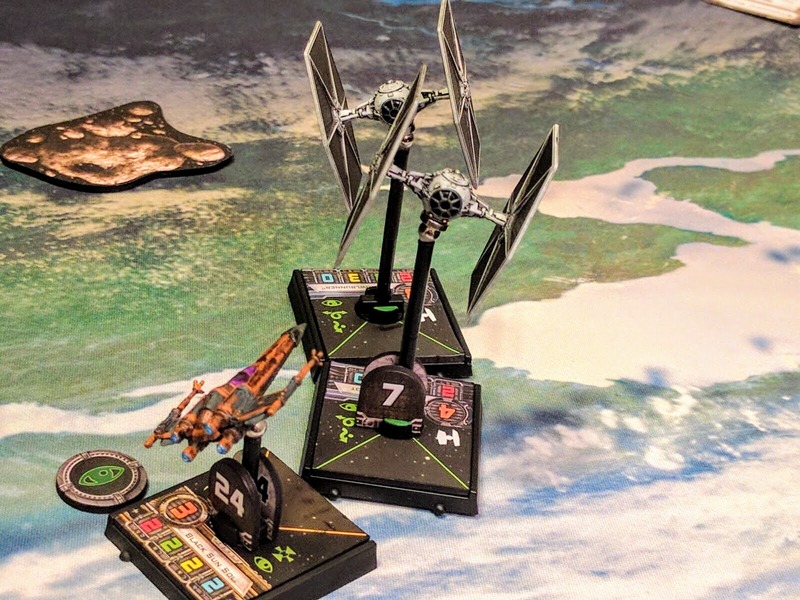 Caveat large scale errors in the scripts or data, it now seems plausible to extend the claim about the PS6 Green Squadron Pilot: It will shoot before the majority of the pilots it will actually face in competitive play. We can actually compute this from the compiled data, PS6 is higher than 52% of all pilots used. Maybe there are better things to do with that squadron point, but now we have hard data about what effect the combo would have and quantitative evidence that it might at least be useful. For a counter example, it would probably not be worthwhile to boost the pilot to just PS4 as the large majority of ships would still shoot before it, and in a blocking role it may as well stay at PS3. Another indication from these numbers is that pilot skill is well balanced. That the average over all pilots in the game is at the mid-point of the range indicates that their designs are probably being spread across it evenly. More importantly, a range of pilots from both the low and high sides of the skill spectrum are useful and actually seeing competitive play. We’re not, for example, seeing a decided favoring of high pilot skill. The former, including pilots with a range of pilot skills, is of course simply a matter of the designers deciding to do so, and you can see this in the blisters nearly all including a mix of pilot skills. But balancing the other stats, points costs, and special abilities to make the low pilot skill generics actually as useful in their way as the high pilot skill aces (and vice versa) cannot be easy. 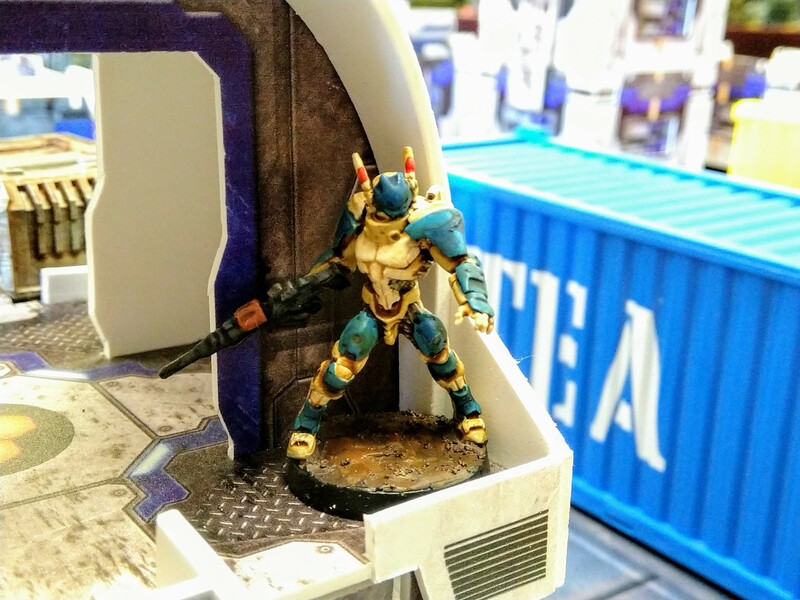 That’s impressive design and balancing for a collectible game grown over several years now, and Fantasy Flight deserves credit for it. Obviously this is just one measure, but it’s indicative of intentional game balancing that has successfully kept a relatively large swath of pilots relevant. Of course, the average is just part of the story. 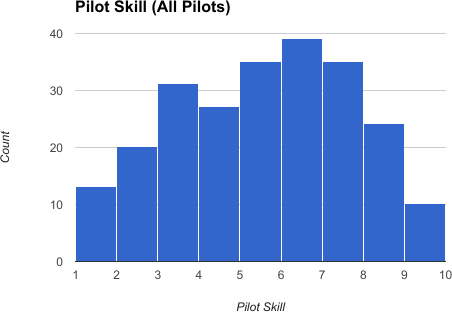 From this compiled data we can also plot histograms of pilot skill. 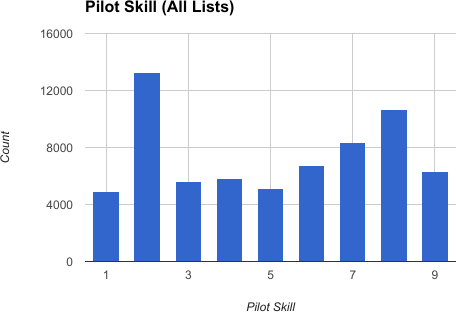 In design terms, these breakdowns show largely what we expect to see: FFG is purposefully including pilots across the spectrum of pilot skills, so the chart of all pilots has a fairly normal distribution with just a bit of skew. The breakdowns of actual use though show a different story, but one you might expect from playing the game for a while: A ton of PS2 pilots see use, and then a mix of aces between PS7 to PS9. Recently though this has smoothed out, with PS2 pilots seeing comparatively less use than they have for the past few years, and comparatively more pilots from the middle range of PS4–6 hitting the table. 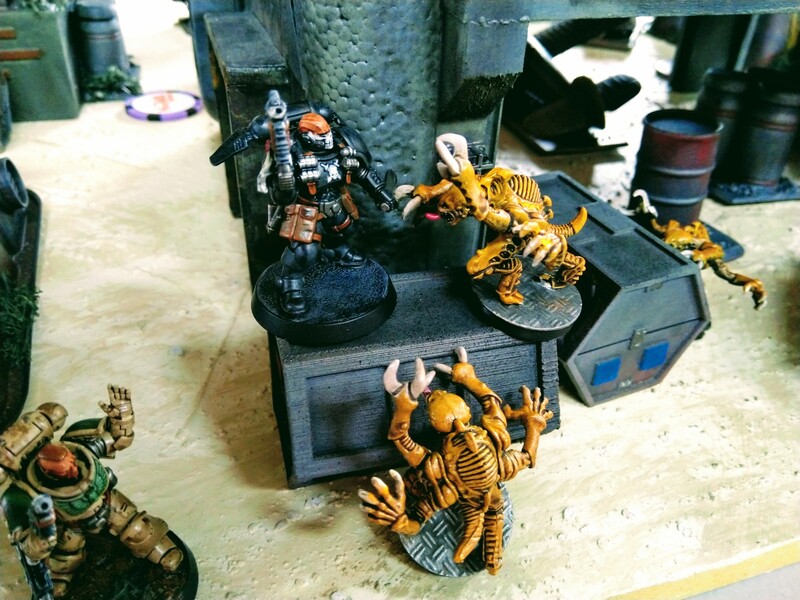 All hail the Syndicate Thug, the unsung but everlasting pilot skill 2 power of the galaxy! One Trick: A single special fancy play or combo. Those guidelines are in contrast to, say, fancy 2-ship builds with a ton of upgrades, true swarms with overwhelming cheap ships, and other list archetypes. Hull Points+Shields: Sum combined hull points and shields of 22 constitutes a durable squadron that can outlast a beating. Agility: Average 3 agility per ship is good, 2 is average, and 1 is inferior. Firepower: Baseline sum total of 10 attacks or more constitutes high firepower. Ships: Lists with 3 or 4 ships are the easiest to play effectively. The minimums here are mostly not informative because of the incomplete lists as discussed above. The others are valid and interesting though. 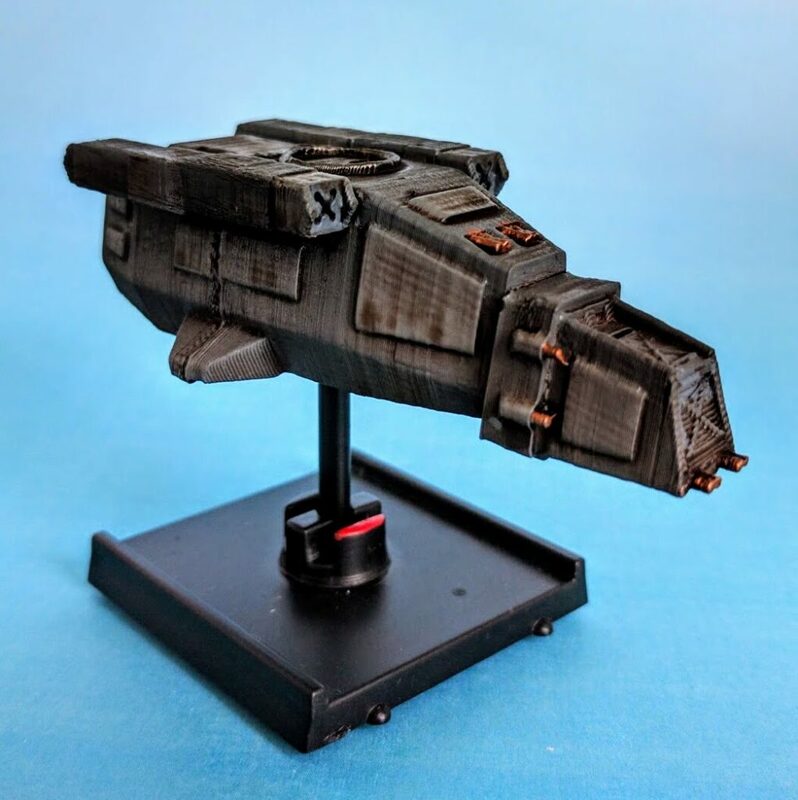 The max hull + shields of a whopping 46 points are from a handful of lists with a Scimitar Squadron Pilot (TIE Bomber) and 4x Omicron Group Pilots (Lamda-class Shuttles). The average of 21 and median of 20 though indicate that my threshold of at least 22 for a “durable” list was a reasonable estimate, capturing 39% of the lists. In the future I’ll probably move that threshold in my own thinking to either at least 23HP+S, for the top 1/3 of the lists, or at least 21HP+S, for roughly the top half. One minimum in this table that is meaningful despite the incomplete lists is agility 0, which occurs in a large number of lists that have been common in competition. Double Ghosts are just one example. As expected just based on the very short scale of the agility stat, average agility 2 is a good target to hit, with about half the lists falling at or below that. Beyond that simple metric, the tradeoff in agility versus hull points and shields is more complex to evaluate. I have some thoughts on a computed metric combining hull points, shields, and agility, and hope to develop that in the future in order to better capture and evaluate ship and squadron robustness quantitatively. In a sense just somewhat counter-intuitively but to be expected, max attacks comes from true swarms like 8x Academy Pilots or Z-95s, and some hybrids with an Interceptor or such thrown in there. My threshold of at least 10 attacks is well higher though, capturing only 20% of the lists. In the future I might consider high firepower to be 9 attacks, for the top 1/3 of the lists, or 8 attacks, for roughly the top half. I was expecting the average number of ships to be a bit closer to 4, driven upward by previously seemingly popular swarms. However, true swarms turn out to be a miniscule portion of the lists fielded in competition, and even 5 ships is very rare. This data supports my belief that most people struggle to fly even that many ships effectively. No doubt part of the perception of swarms’ popularity was in fact their rarity combined with their necessarily homogenous nature, whereas all the many many more 2- and 3-ship lists don’t get grouped together mentally. 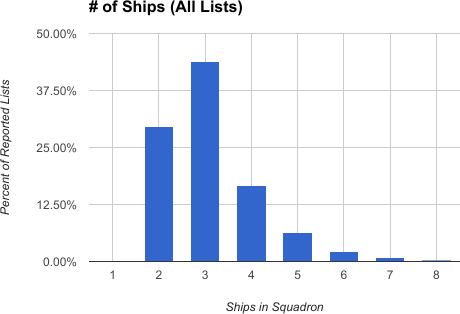 As expected, most people fly 3-ship squadrons, with the next big group fielding just 2. 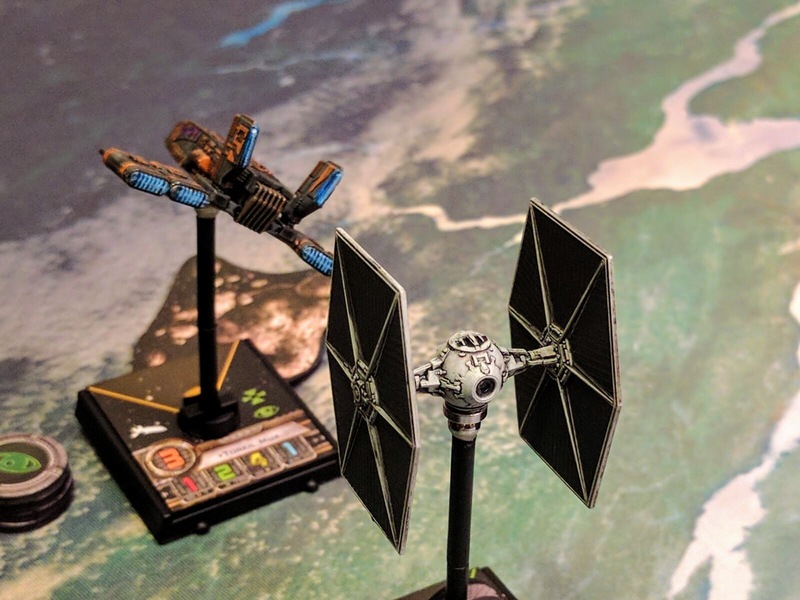 Squadron points being what they are, this necessarily means the latter are flying higher cost pilots loaded with upgrades, which lines up with looking around at game nights and seeing people working out complicated webs of pilot and upgrade combos. I still recommend beginners stick to 3 or 4 ships until they have a solid grip on basic flying. As a sidenote related to squadron sizes albeit in complex fashion, most people are spending about 72–78 squadron points on ships/pilots rather than upgrades. As noted in the table above, about half the lists have an average pilot cost of 27 or 28 points. Some computation of ship points versus upgrade points is a promising measure to develop in the future for evaluating the characteristics of given squadrons. Fewer points spent on ships in total. Together this all implies a trend toward more utilization of unique pilots and upgrades, slightly more favoring of special abilities over bigger squadrons and basic dogfighting. That makes sense intuitively thinking about some of the ships and cards that have come out recently versus the earlier, simpler collection. However, more analysis would have to be done to determine if this is a statistically significant trend or not. That analysis also lead to some additional confirmation of my rough metrics for evaluating squadrons by my four-bullet rubric of durability, firepower, ships, and one trick, and generated data to refine the concrete quantitative thresholds a bit. 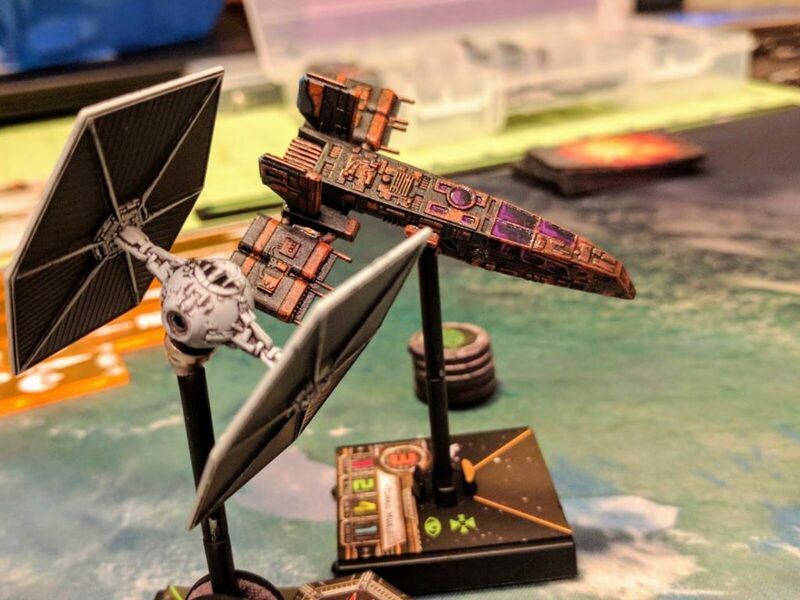 Along the way I wrote some tools to pull data from a couple of the great resources the X-Wing fan community has created, namely XWS Spec, X-Wing Data, and ListJuggler. Many thanks to the developers and contributors to those tools and resources! In return, I hope others are able to make use of the compiled data I’ve made available for easy analysis. If there’s interest I’ll update the archives and post announcements as new ships are released, so please let me know if you actually use the data. I also plan to update these scripts in the future to incorporate additional data, namely upgrades in addition to pilots, as well as perform other aggregation and calculations. A classic albeit underpowered matchup! 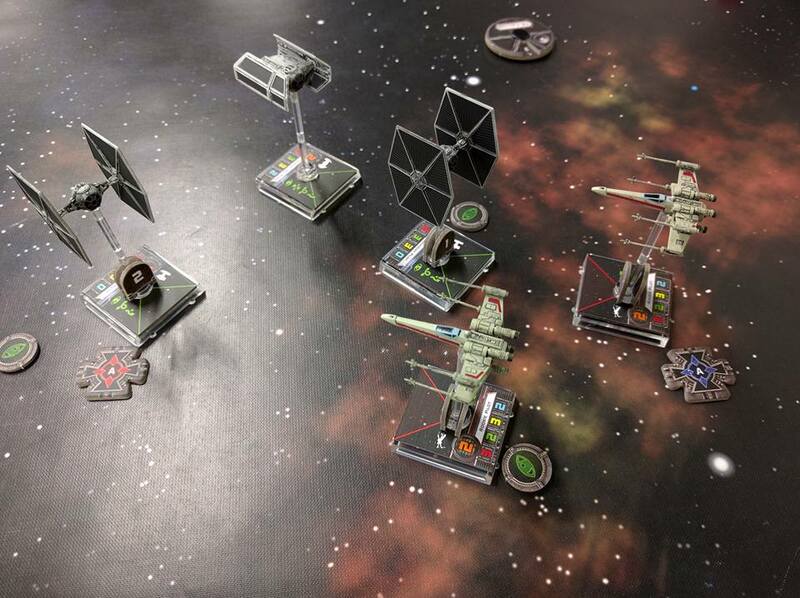 I’ve been playing X-Wing miniatures for all but literally a year now, starting just before last year’s X-Mas Wing Tournament @ Redcap’s. 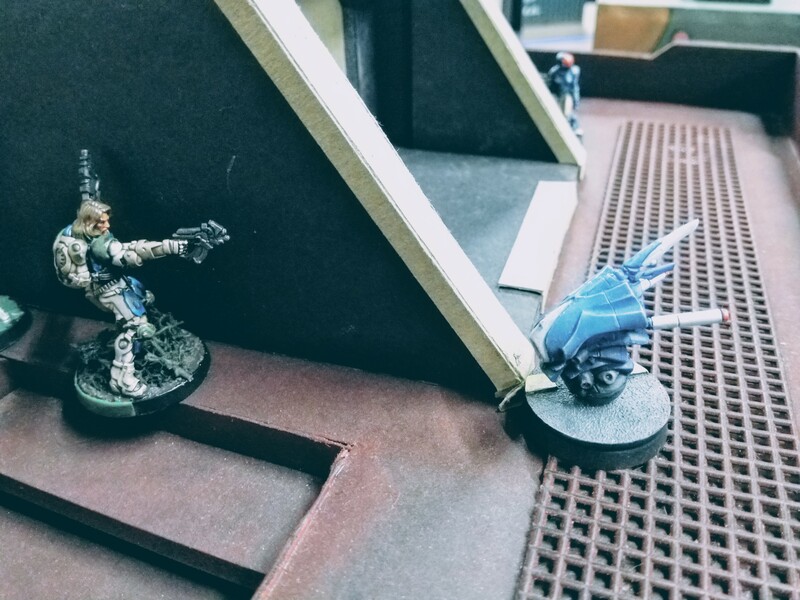 That whole time I’ve largely been employing a particular style of build and practicing literally just a couple different squadrons that have turned out to work pretty well. 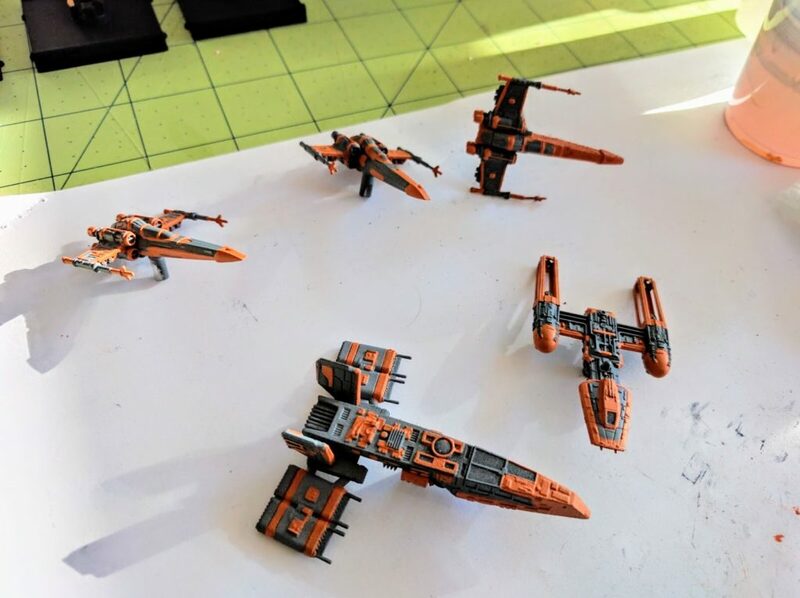 To mix things up, have a slightly less hard-hitting squad for more casual play, and to fly some more off the wall stuff, I put together a new list and then painted up a whole squadron to match. 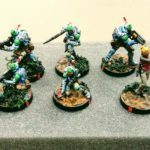 Here I present some glamour photos, but more importantly a tutorial walkthrough of the process in hopes it helps newcomers interested in giving repaints a try. The Spice Pirates Patrol squadron. Is this a great list? It’s ok, but not great or super competitive. I’m sure I’ll be tweaking it. Comparing to my standard rubric: Hull+shields is a bit low, average agility is a bit inferior, and damage output once you factor in the turrets is above average but not amazing. The real weaknesses I’ve found so far though are that the squadron isn’t very maneuverable, the Z-95s die easily, and they have to prioritize blocking over jousting, which is a harder skill. 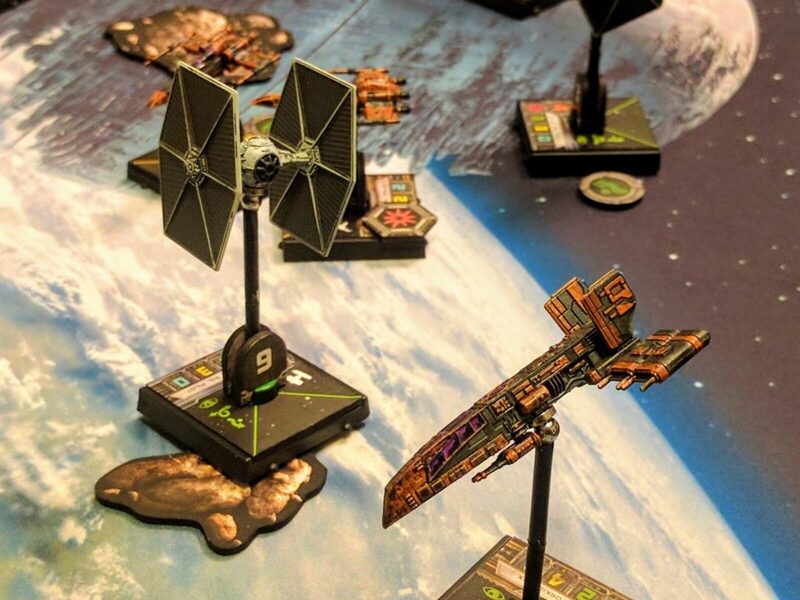 So I’m not planning to take it to any tournaments, but after just a couple games it seems to be competent for casual play, fun to fly, and probably not a setup you’re likely to see another of on the local tables. I’m hosting a beginners’ night next week, what can I fly that’s fun and credible but not overly strong? In a year of playing I’ve never ever used this Z-95 I bought, can I flip it to Scum and use it there? The shop is way overstocked on HWKs, they’re on sale, and I love them, how can I justify another one? Most Wanted is also on sale, what’s a neat list that will use all of that plus another HWK and my Z-95? And here we are. 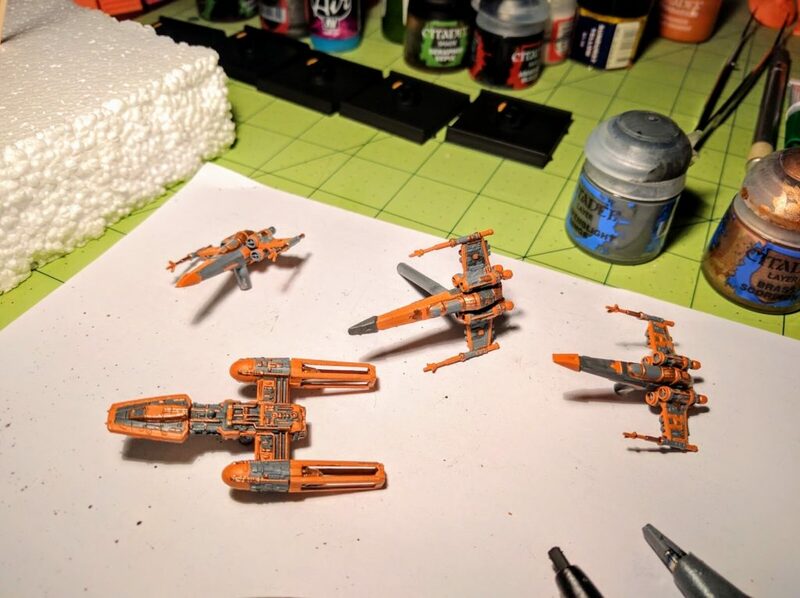 Obviously I couldn’t have a Rebel Z-95 mixing with some Scum, or two Moldy Crows in my fleet, so in a fit of late night and early morning inspiration I repainted them all to match. 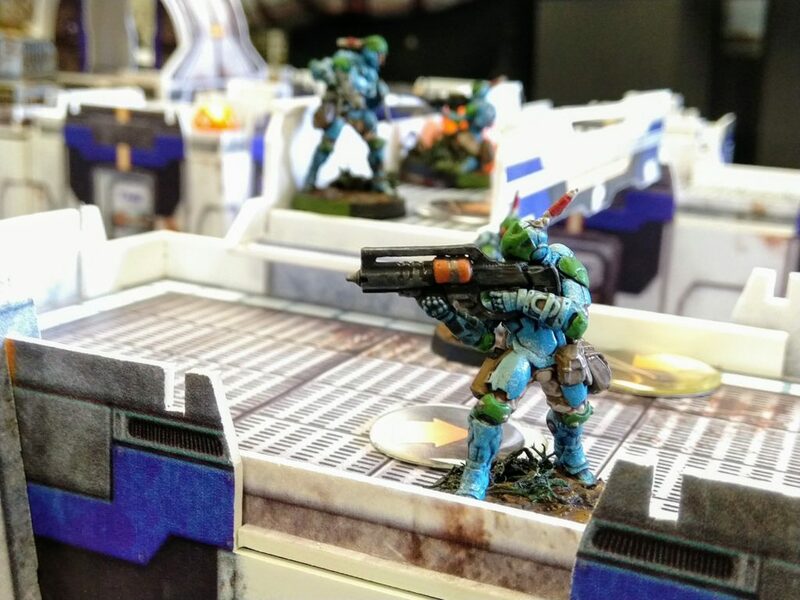 Later they got magnetized as well. So far I’ve had a couple fun, close games with the squad, and am happy with the whole project. 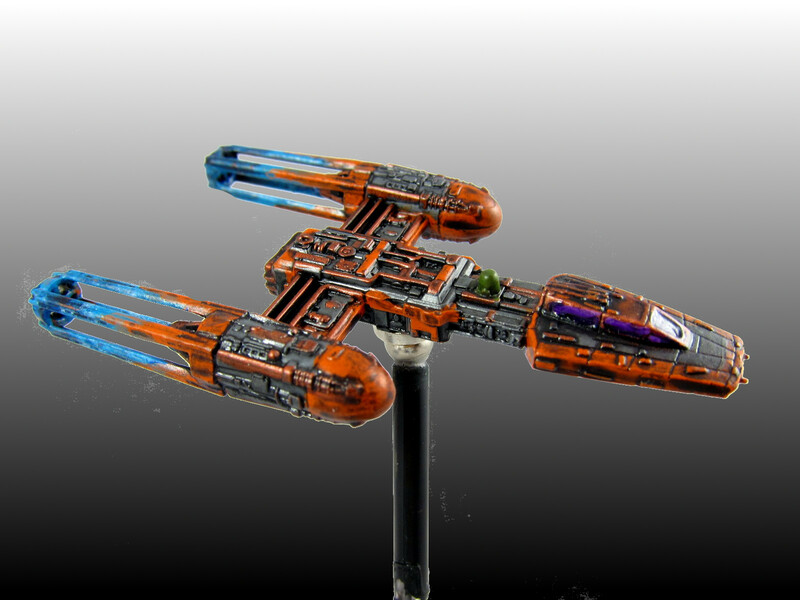 Kavil’s Y-Wing, engines spewing ions. I’m writing up this repaint because I think it came out well and the local reception has been very positive, but it was really fast and easy. 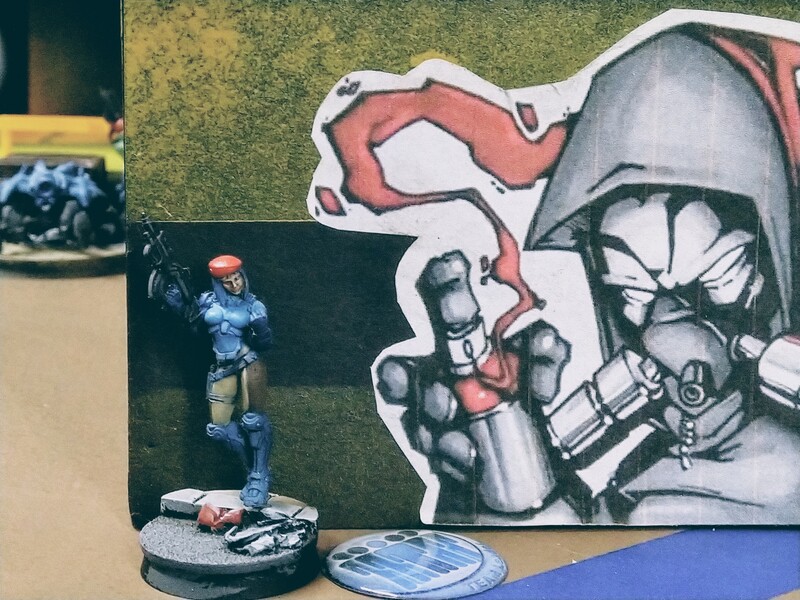 I’m an average miniatures painter in raw skills, but I get what I think are hopefully just-above-average results by being smart about the process and using some basic “tricks.” Anybody can get at least the same quality outcomes, and you should give it a try if you’re interested! 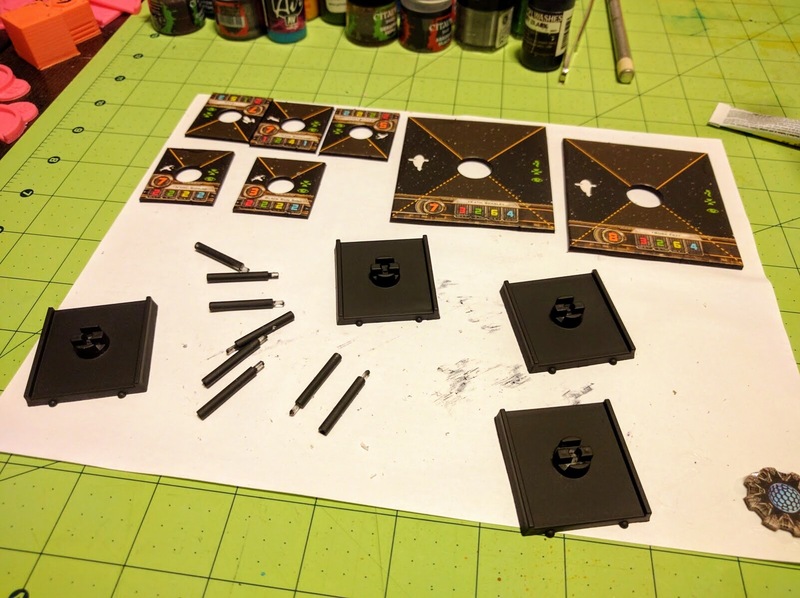 First up, black out your ship inserts, bases, and pegs. 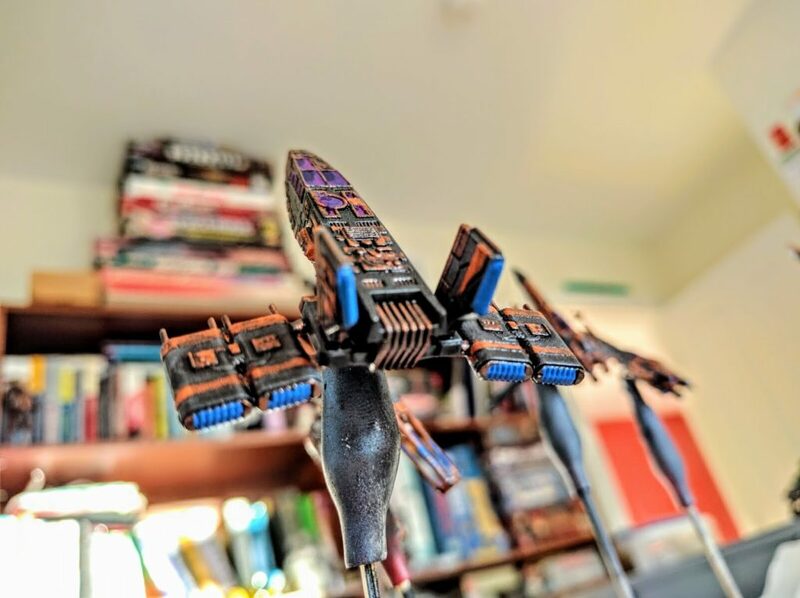 I’ve done this for all my ships, all my tokens and templates, even my damage deck, and it really boosts the visual appeal of any squadron. All the cardboard bits you can do with just a standard Sharpie or similar small-point permanent marker. 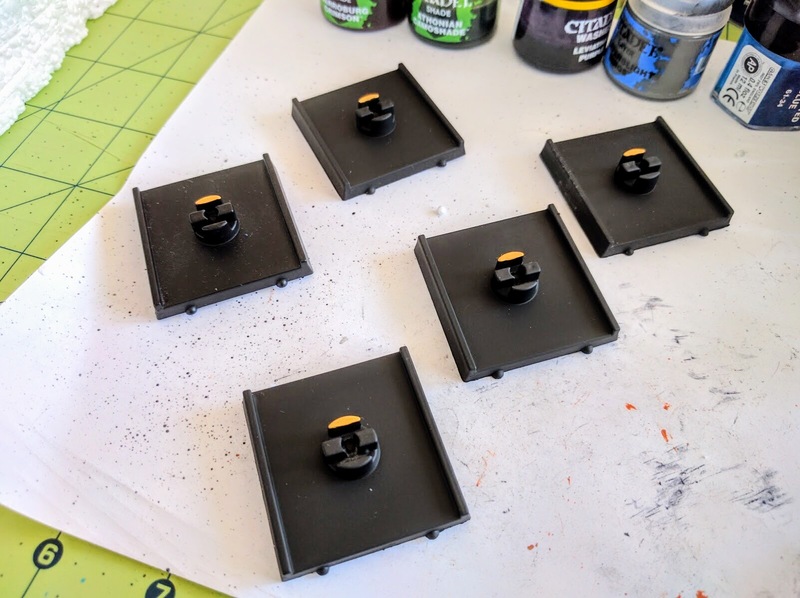 The bases and pegs I spray paint black. Hit the bases diagonally from one direction, let them dry, rotate them 180 degrees, hit them again, and you’re done. 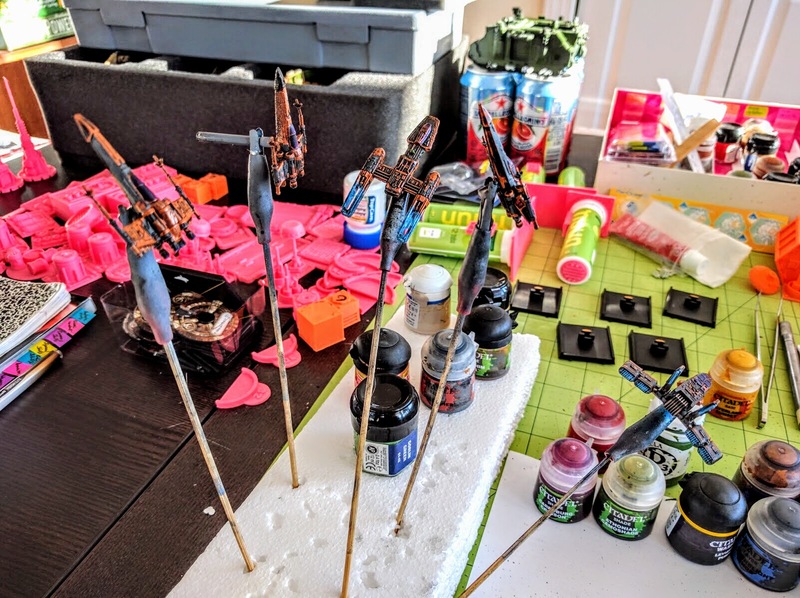 I use alligator clip sticks to hold the pegs for spraying and drying so that the fine paint doesn’t get marred by handling them. I use these similarly for the ships as well, which you’ll see below. 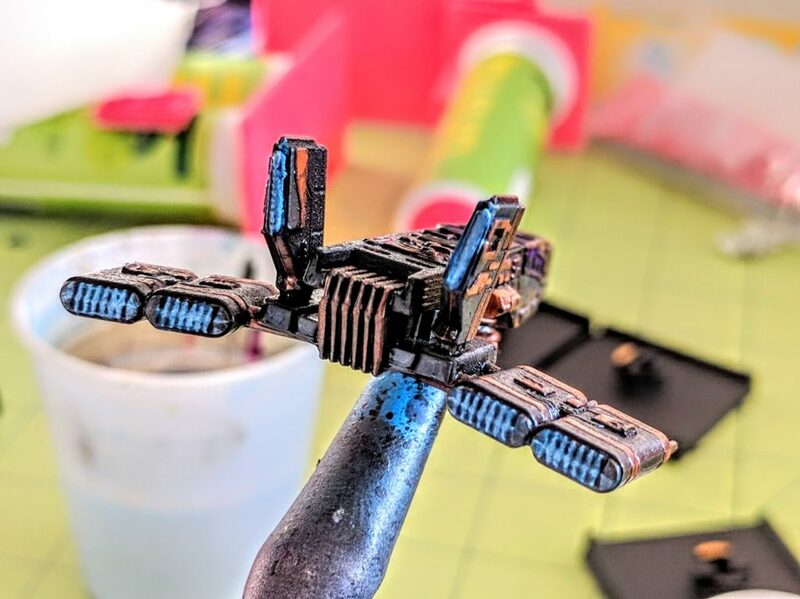 The real trick on the bases though is to spend a minute and paint the front of the peg holder in a color to match the arc on the ship insert (red for Rebel, green for Imperial, yellow for Scum). 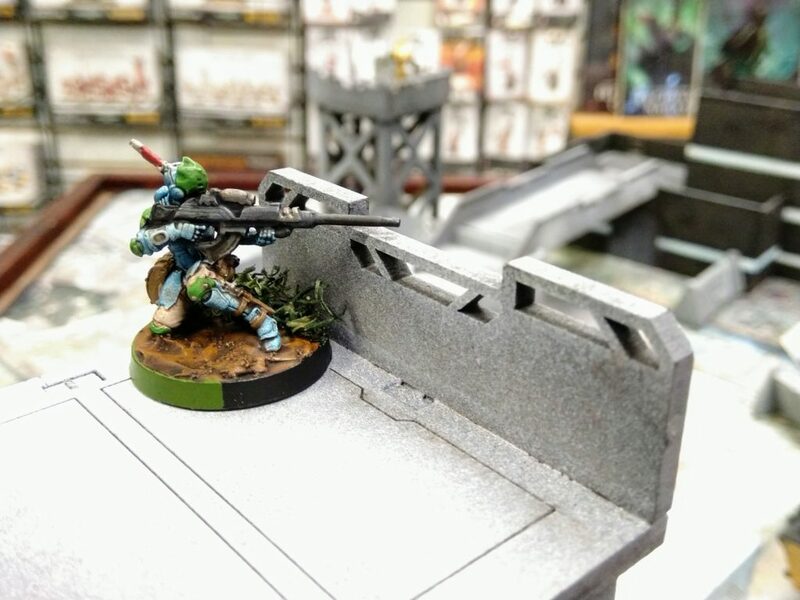 This makes the base really pop visually, and as a bonus eliminates the hassle of trying to figure out which way is forward (you of course won’t be able to see from above the arrow included on the underside once you paint the base). Sides of the cardboard pieces have all been blacked out with a Sharpie, while the bases & pegs have been spray painted. 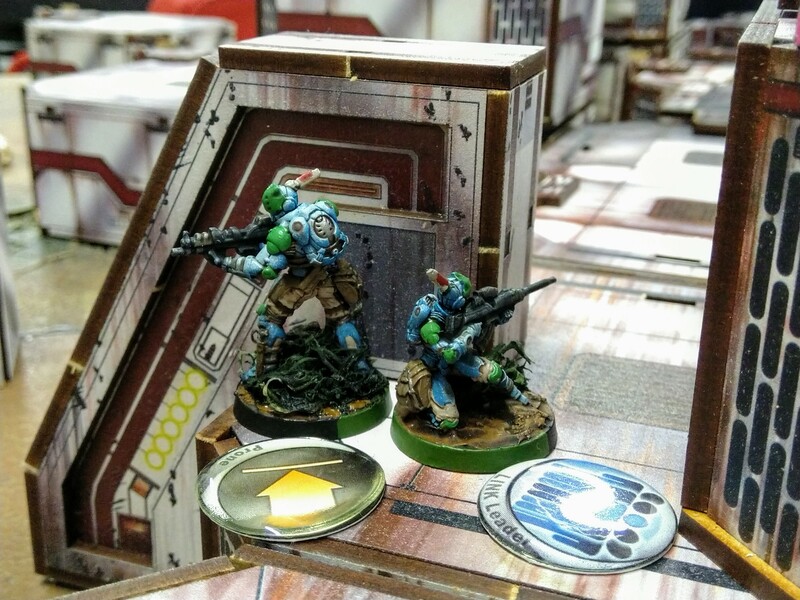 Great small touch: Paint the peg holders to match the arcs on the ship cards. Next up is priming the ships. It’s not worth trying to strip off the existing paint jobs. The paint and plastic used makes it very hard to remove, the pieces are delicate and not prone to scrubbing, and it’s all a very thin coat anyway. It’s just not worth it. In many cases you may not even want to prime the ship if you’re just reworking some areas. 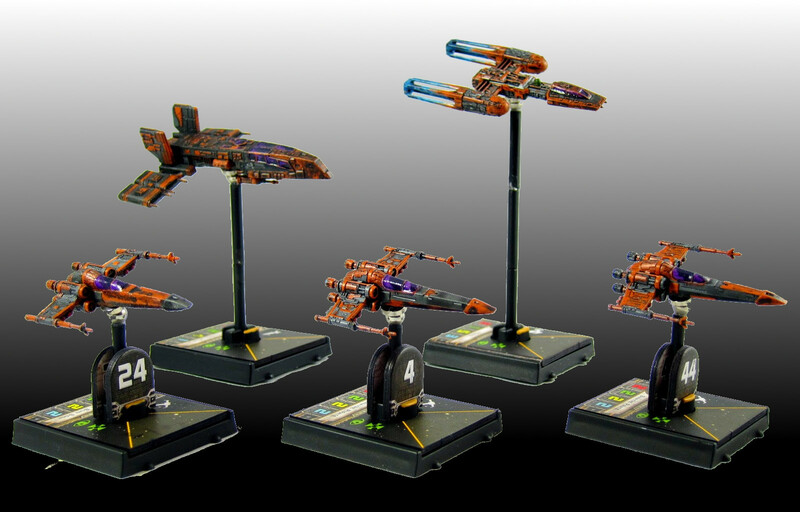 However, these ships all had a variety of stock paint jobs. I wanted to be sure the repaint started from a consistent base so they all wound up matching, so they had to get primed. 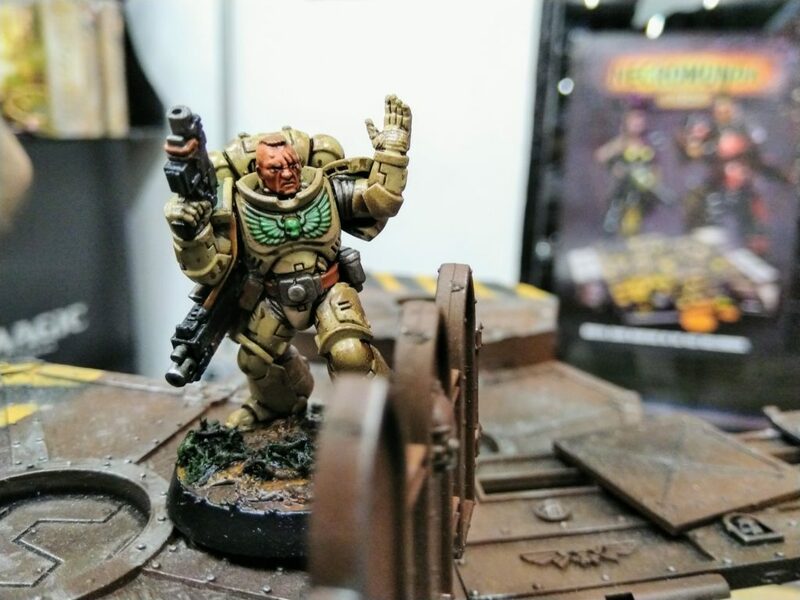 For models with such fine details you want to be very wary of putting on too many coats of paint, so rather than the black or white I use for most miniatures and then painting on colors, I spray primed these directly in the grey base I wanted. A wide variety of fancy primers are available specifically for miniatures. The big appeal of these is that they adhere well to models, but are very thin, preserving the detail. The big downside is they’re expensive, and the cans don’t last very long. I just use cheap, everyday matte spray paints found in the hardware store around the corner. 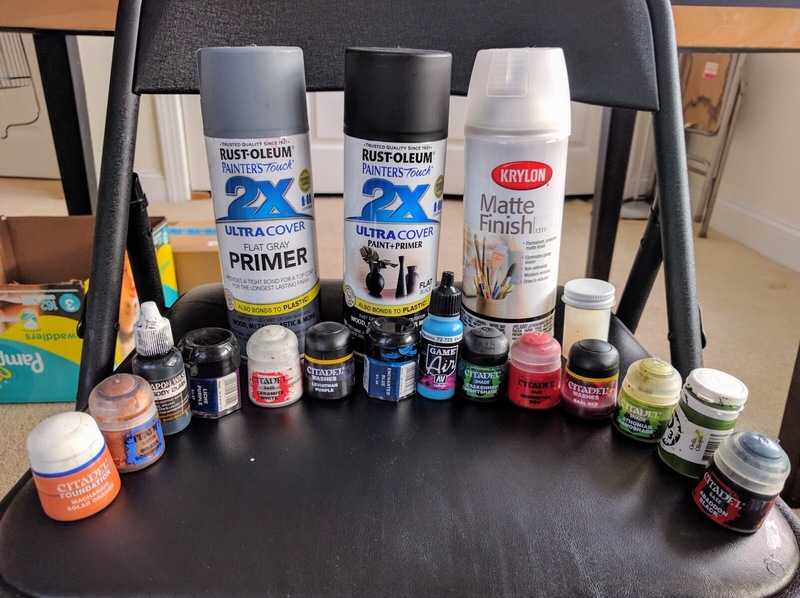 I don’t always use paints specifically marked as primers, though in this case I did. 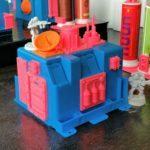 In using standard spray paints, the big thing to keep in mind is the necessity of keeping the paint thin. Spray at a good distance from the model (maybe 12–16″ or so), and in quick but steady passes and just one or two at a time. If you need to hit another angle or need another layer, wait until everything dries and then rotate the model and do another quick, thin pass. 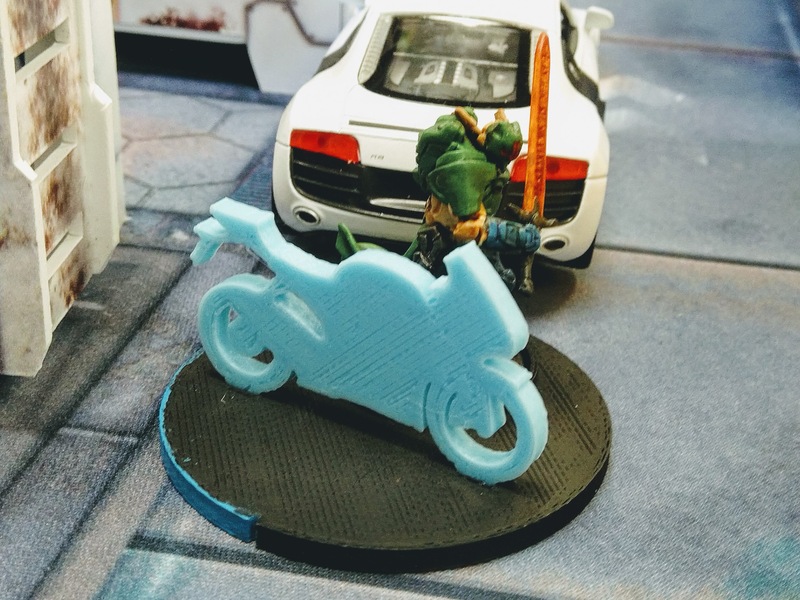 I used the alligator clip sticks mentioned above to hold the models for this so I could rotate them while spraying and prime all angles in one go. 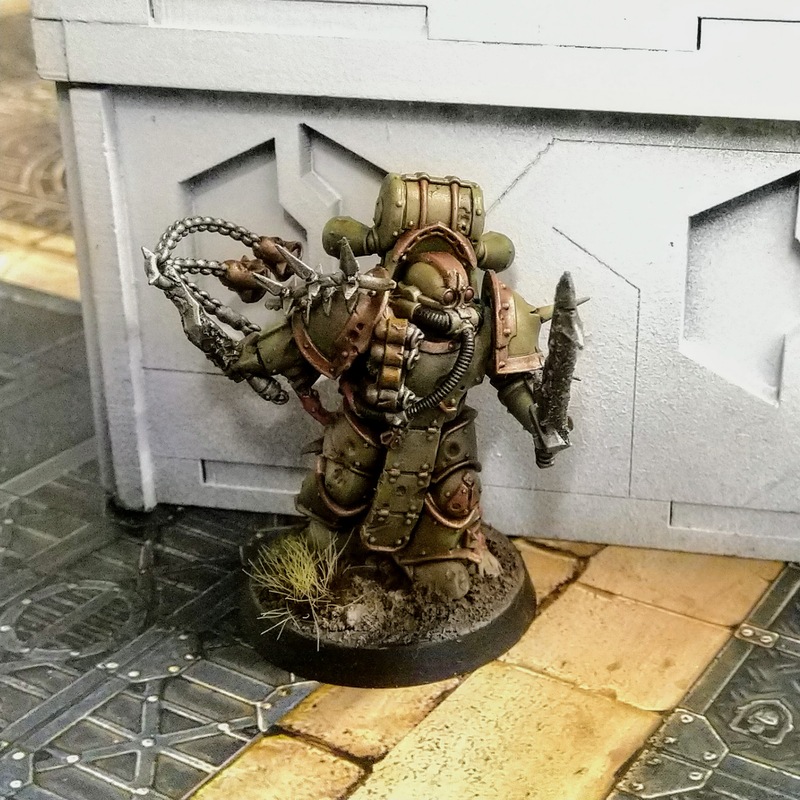 If you’re new to all this, or using a new paint, start with the model you care about least. 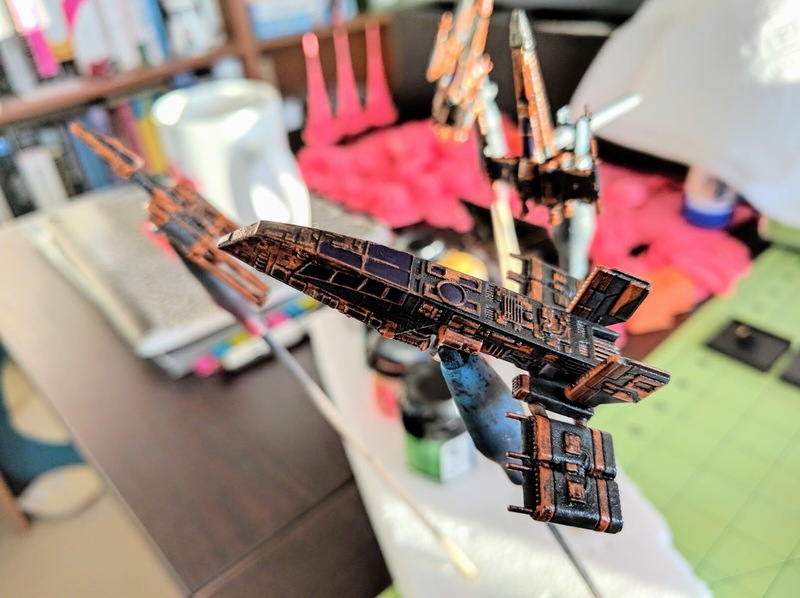 In this case I started with a Z-95 to make sure the paint wouldn’t be too thick, because in event of catastrophe that would be less of a loss than if the Y-Wing or HWK got messed up. In actuality here the first couple shots out of the can did fuzz up a bit on the underside of the model, but not enough to be visible in play even if it were on top. 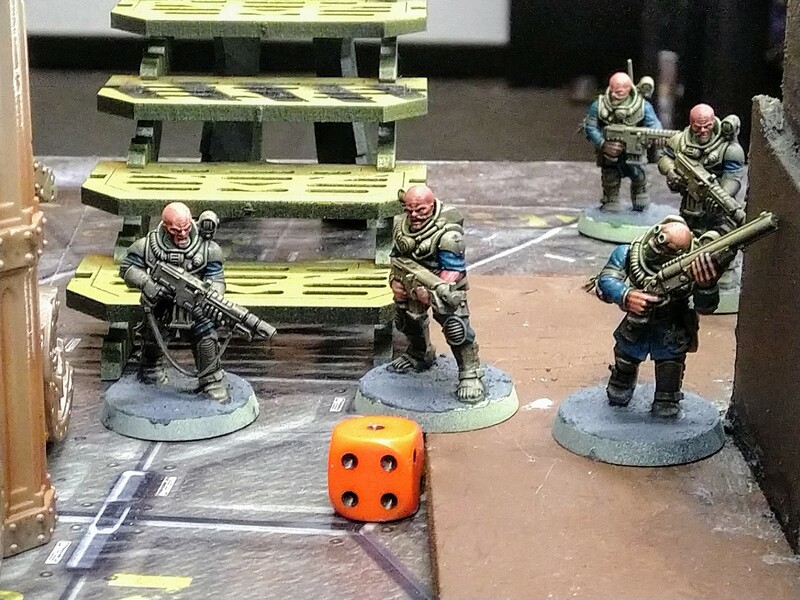 An important “trick” in getting nice, classy miniatures without a ton of work is just to keep it simple and obvious. Use just two high contrast colors as the base, pick out some other details, and call it a day. It’ll look great. Multicolor schemes, complex patterns, etc., should all be saved until you’re sure you know how to make it work. Here I went with orange as a second color to contrast well with the grey base. Orange is also my favorite color, seems reasonably associated with “spice,” and isn’t strongly associated with either Rebels or Imperials. I basically just went around each ship more or less arbitrarily picking out section of hull, panels, and some details in orange. On the Zees I made a conscious decision to have them be consistent and similar to each other but not precisely matching. Just like with the spray primer, it’s important with such fine details to keep the paint thin. 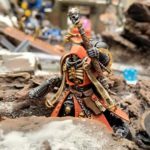 You generally really need to start with miniatures-specific paint, and even then often need to additionally thin it a little bit with water. I use an eyedropper and an old brush to carefully put in and mix just a few drops of water into the pot. Try your paints on a piece of paper or other scrap material first. If you feel like the paint might be thick and globbing on, then it is and needs to be thinned. Depending on the color it’ll take multiple coats to get it solid but not overwhelm the details. Here the orange bits were generally two coats and three on the larger sections. 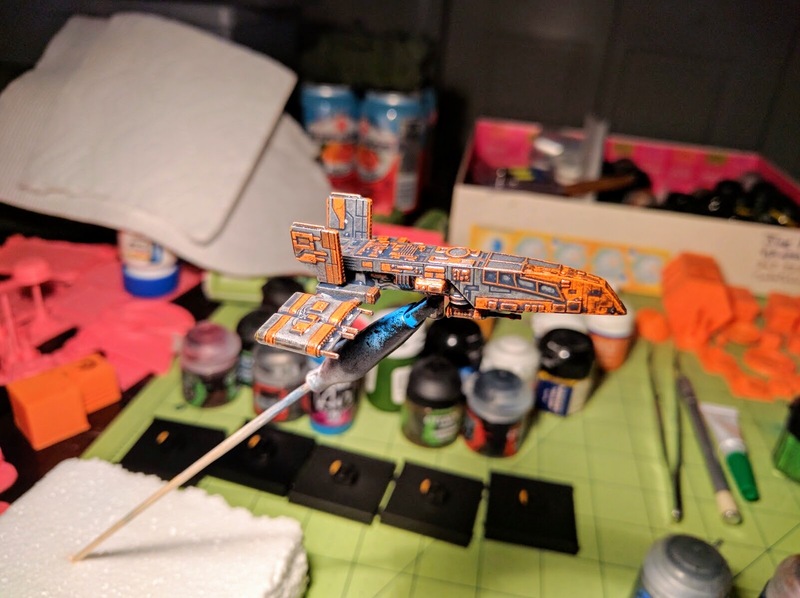 Sections of hull, plating, and some details painted orange. Next I painted some of the other plating, window frames, piping, and other details in brass. The rationale for this choice was that brass would contrast well with the grey base, but complement the orange sections. 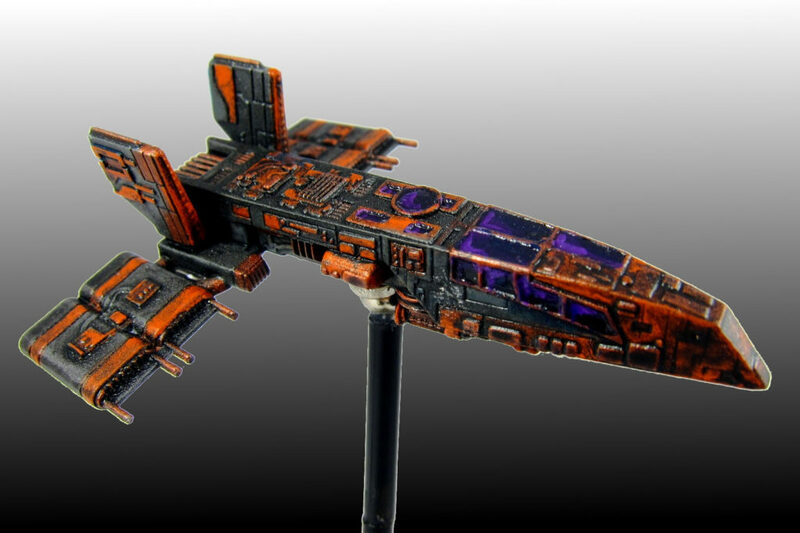 From a distance the orange and brass blend together, so the ship just looks grey and orange with some subtle texture to the latter. On closer inspection though, the mechanical details pop out in brass. Details picked out in brass. The next big step is just to wash everything. A lot of people default to almost always using a black wash. I encourage you to step back and think about that for a moment though before plunging in. Often a brown or a green will work better. 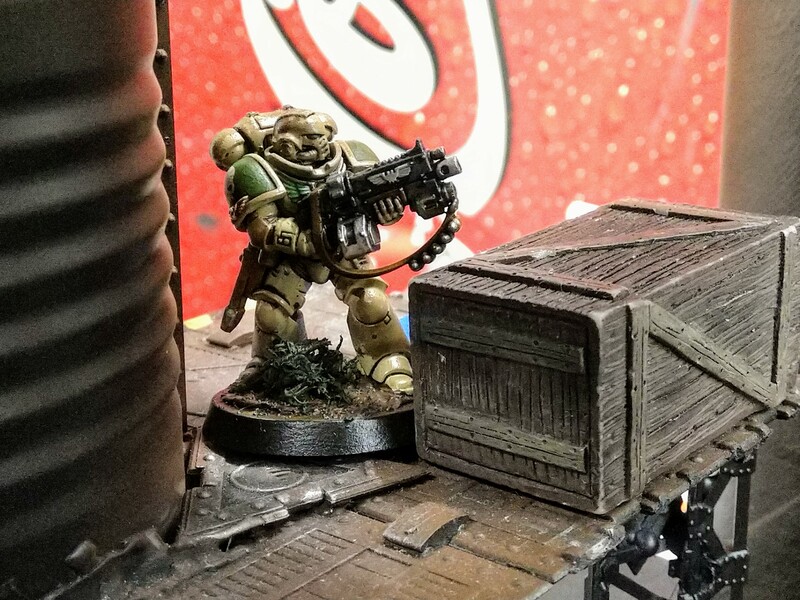 For example, some DX-9 Stormtrooper Transports I also painted up recently for an narrative event came out fantastic after picking out some panels and details and then just doing a heavy brown wash. It gave exactly the worn, battle weary look I wanted, whereas the couple I did in a black wash for variety’s sake are also well shaded but don’t have the same kind of immediate natural, intuitive interpretation. Note the brown wash on this DX-9 Stormtrooper Transport. For the Spice Pirates though I went with a black wash. The ships and consequently their surfaces and panels are small so I was mostly going for simple shading rather than wear, corrosion, or some other natural interpretation. I knew the black would look good on the orange and brass but I wasn’t sure a brown would. I also wanted to bring the overall tone down and really darken the grey, which a brown wash wouldn’t do as much. 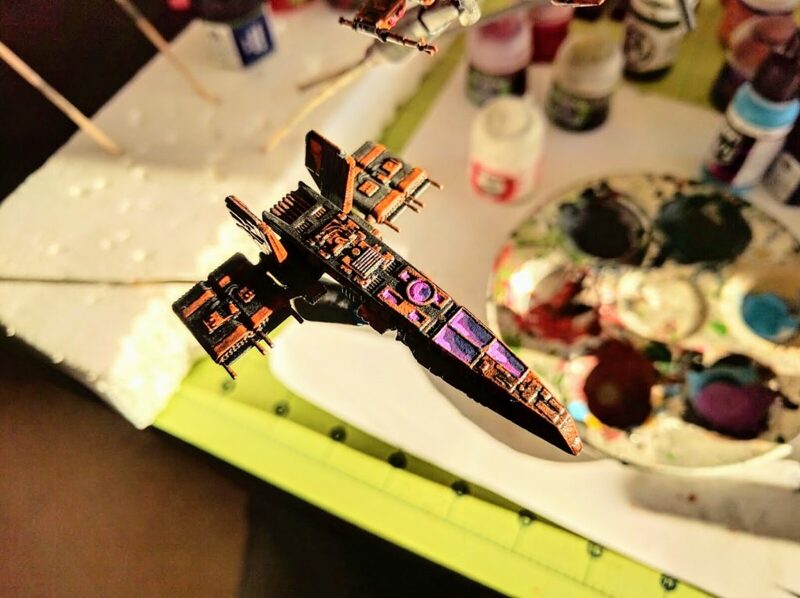 The HWK in particular I wanted to be darker, with a feeling of being a black shadow supporting the squadron. After this photo it got several additional washes to visibly darken it more than the others but not lose the grey/orange scheme. 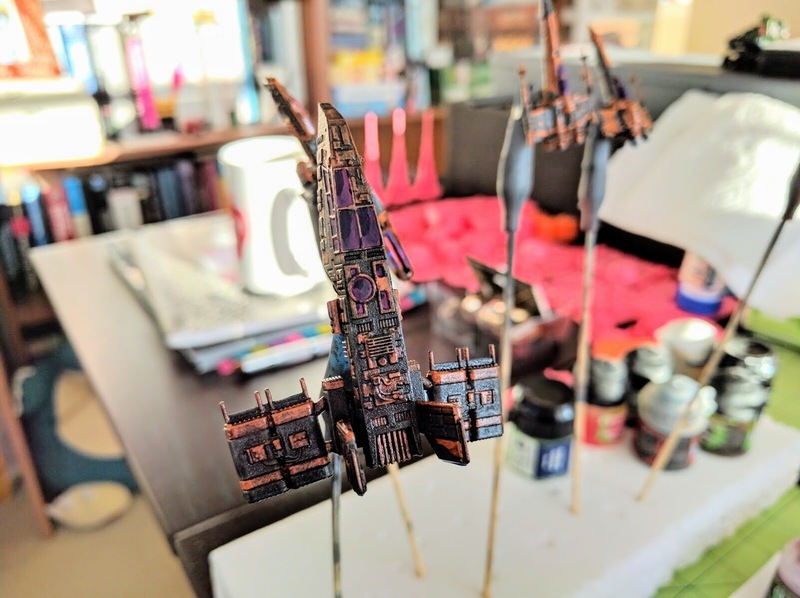 First black wash on the HWK. At this point the ships already look good and are very flyable. But I did just a couple more details, starting with the windows. Here I added just a hint of another color by choosing purple. I thought that would work well because it contrasts with the orange and brass, and is dark enough to fit in with the grey and not create a jumble of colors. These I did quickly in three steps. First is a dark purple base. Then I lightened just a couple brushfuls of that by mixing in a white, and painted half the windows. You’re trying to create some vague notion of light on the surface, so apply this lighter color all in a consistent pattern on the different panels as though it were from light hitting from a particular angle. Then I lightened up that paint again with some more white and applied some purple-pinkish highlights in the corners. All of the window panels were then carefully covered with a dark purple wash to bring the colors back down and blend the three layers just a bit (not pictured). The next big detail is engine glow. Even a half competent job at this can bring a lot to the look of a ship, particularly in photographs. I start with a solid deep blue base over which I sloppily drybrush a brighter blue. I then brighten up a couple drops of that blue with some white and drybrush that in the centers. Finally the engines get washed in a blue to bring the colors back down a bit and re-emphasize any texture depth. You may not want to do that step if you want your engines to burn very brightly. Starting the engines with a solid blue. Washing the engines with a dark blue. 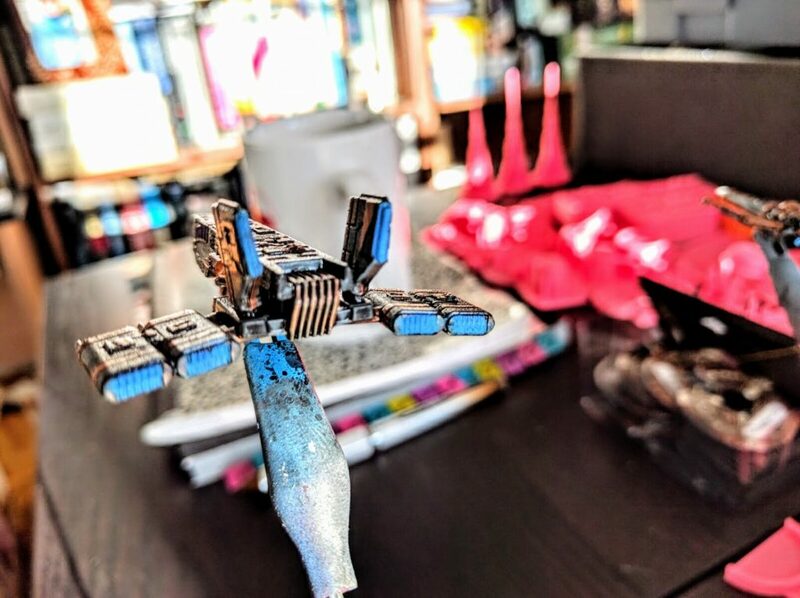 It’s worth noting that I went way overboard, perhaps nonsensically so, with the engine glow on the Y-Wing. My conception, going along with not just Scum in general but the Unhinged Astromech in particular, is that this is a beat up old ship that’s been hot rodded. I assume they’ve got the engines chopped and tuned to get those green 3 maneuvers, prioritizing raw max power over efficiency and safety. So its engines are just spewing ions and magical Star Wars go-juice in a cloud behind the outlets. Wrapping up the painting are just a couple details. 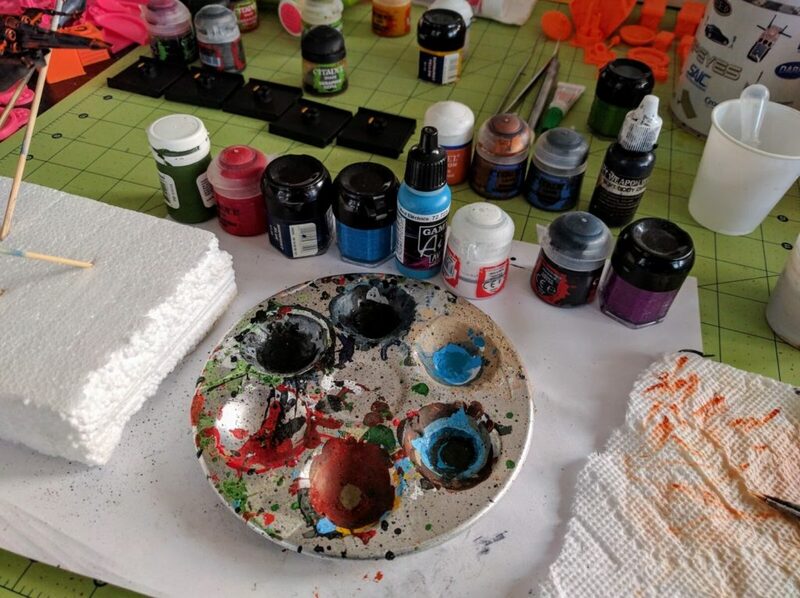 As I go through the steps of painting base colors, washing, etc., I make a line of paints on my work area as a to-do list of the different bits to be done and colors to use. 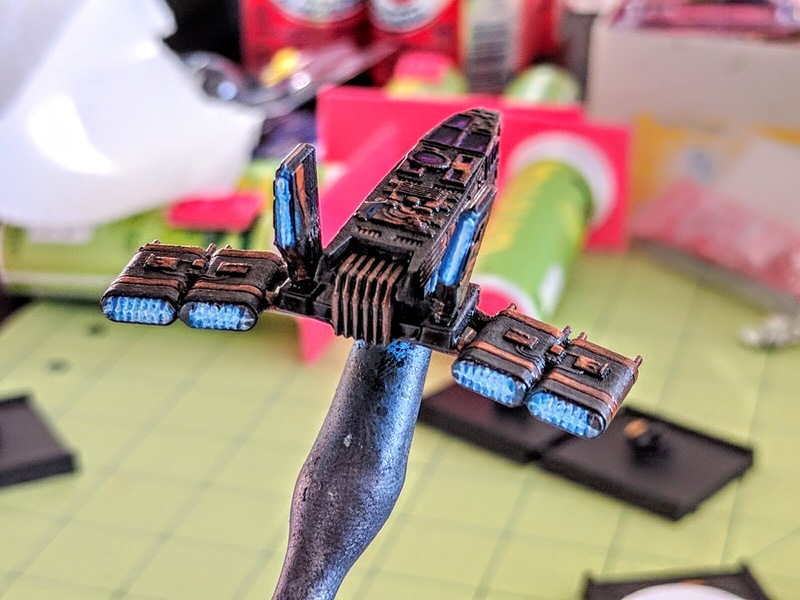 For this project I started that while doing the black washes, as I was looking at the whole of each ship, so I wound up with a line of purple for the windows, blues for the engines, and then a few odds and ends. 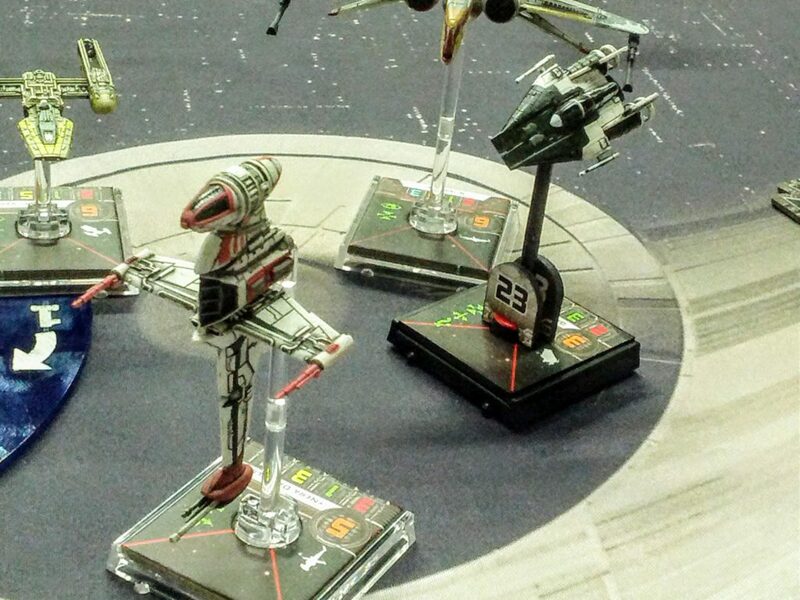 Some of those here are red for the missile heads on the Z-95 wings (I assume that’s what they are), green for the Y-Wing’s astromech, and black for the peg holders. So far I have not blacked out the magnets. Mostly I just haven’t gotten to it yet, but I also think the paint will grind off very quickly. For the heavier or larger ships—the HWK in this squadron—a layer of paint might also be just enough to impair the attraction sufficiently to make them fall off the stand a bit more easily. Everything drying after some additional washes and final touches. Last but not least, I seal everything with a matte spray dull coat. 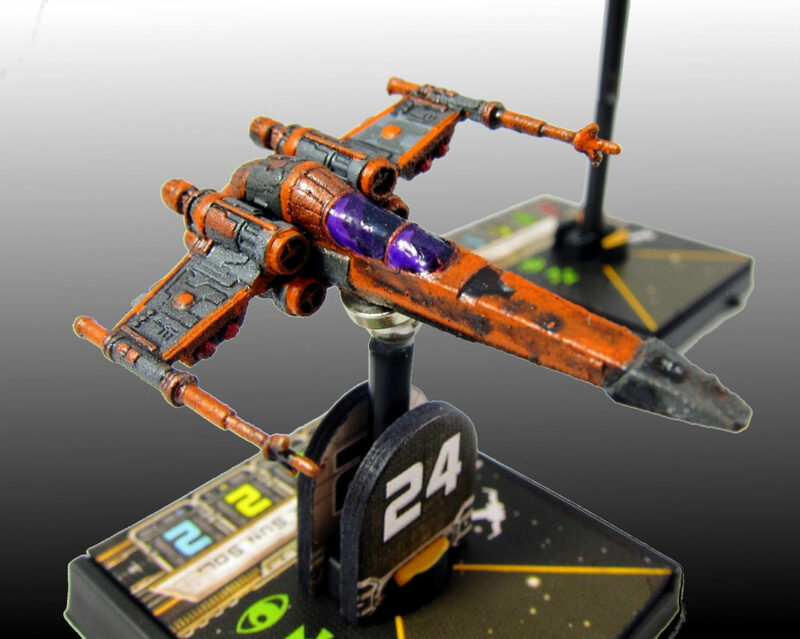 On a plastic miniature there’s not normally a great danger of paint being rubbed off, but in X-Wing the miniatures arguably get more handling than normal so it’s maybe more of a risk. Either way, the dull coat reduces the shinyness that washes in particular tend to create. However, I also wanted the windows and engine glow to keep more of a sheen. So after the dull coat I used a brush-on gloss coat to make the windows shimmer just a little bit as the light plays across them, and the engines to pop a bit in photographs. Gloss Coat (windows+engines): Some unbranded brush-on stuff from a model kit that’s been kicking around in my paints box for over a decade now—hallelujah it didn’t ruin the models! A lot of those are older paints; my Liche Purple and Enchanted Blue pots are over 10 years old. So some of the specific names may not be available anymore. But these are all basic colors, easily found. I also stress that you could easily get by with many many fewer colors. Do the mechanical details in orange instead of brass, do both windows and engines in blue or purple and just mix the engine colors with more white, etc.. You could get great looking ships with just primer, base color, engines, wash.
All of the paint & sealants used in this repaint, many more than are really necessary! That’s it! It might seem like a bunch of steps, but they’re all small and quick. I did the blacking and priming late one night and then did everything else in the morning before anybody else got up, so it’s not a very time consuming process. 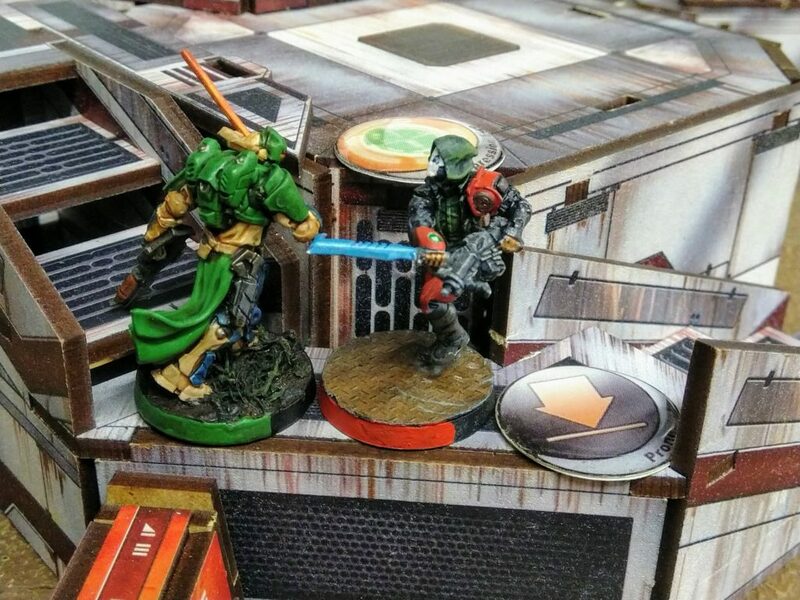 Wrapping up, these are a few action shots from a game with my buddy Matt to show how they look on the tabletop. I hope you enjoy the look, and got something out of this tutorial!